We are located in the centre of London near The British Museum and our address is 105 Great Russell Street, London WC1B 3RY. The nearest London Underground Station is Tottenham Court Road which serves both the Central and Northern lines. We are less than 5 minutes walk away from the station going north on Tottenham Court Road. After 65 metres from Oxford Street take the first right hand turn which is Great Russell Street. We are located 200 metres down the street on the left side at number 105. We have a green exterior. Two other tube stations are within 15 minutes walk: Goodge Street and Holborn. For reaching us by car, there are 3 possible parking arrangements. There is a large NCP car park on Adeline Place with the entrance 70 metres from our front door. Further down Great Russell Street past The British Museum in Bloomsbury Square is another NCP. There is a taxi rank immediately outside the shop and, at both ends of the taxi area, there are car parking spaces with ticket machine close by. We are open from 9:30 a.m. to 6.00 p.m. Monday to Saturday. Phone Call us on +44 (0) 20 7636 1045 during the shop opening hours. Payment can be made using Visa, MasterCard, American Express, Delta or Switch cards. Fax us on +44 (0) 20 7636 3655 , 24 hours a day. Send your order and cheque to the address above. Please phone sales to confirm the delivery charge and allow time for cheque clearance. 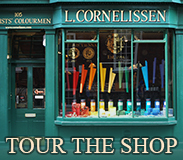 Send us an e-mail at info@cornelissen.com. Do not include your credit card details in the e-mail. If you wish to e-mail your order we will happily phone you to collect credit card details securely. Our internet site provides on-line purchasing. We apply carriage charges at cost. They depend on weight, destination, size of items and number. We use a very cost effective delivery company and will happily confirm the total cost before dispatch if requested. An additional charge of £1.50 plus VAT is applied on each transaction for packing and handling. The website will calculate delivery costs for online orders.